HOUSTON—Hispanic organizations are mobilizing as a national network to continue demanding comprehensive immigration reform from the White House and pushing for a moratorium on immigrant detentions and deportations. “The government has been promising a comprehensive immigration reform but nothing has happened. It’s just a bunch of hypocrisy,” said Hector Chavana, Jr., of the La Raza Justice Movement. “While they keep breaking their promises, families are being destroyed by deportations and raids. Children are being separated from parents. People don’t understand the impact that this is having on generations,” he told The Final Call. 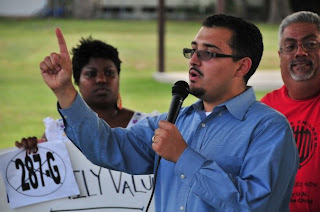 Mr. Chavana recently led a rally in Northeast Houston with a two-fold mission of applauding what he calls a “small victory” toward ending child detentions while voicing demands for a complete moratorium on all immigration enforcement laws. Last month, the Obama administration declared that children would no longer be detained at the barbed-wire encased T. Don Hutto Detention Center facility in Taylor, Texas. The American Civil Liberties Union filed a lawsuit in 2007 charging that children were being illegally imprisoned under severe dehumanizing conditions. The ACLU’s lawsuit was filed on behalf of 26 immigrant children. On Aug. 27, the ACLU announced that a settlement had been finalized with U.S. Immigration and Customs Enforcement to improve the prison-like conditions at Hutto until all of the families are relocated, which may take until December. “We are very happy about this but we still have concerns that the government may open other detention centers,” said Vanita Gupta, an ACLU staff attorney based in Washington. She told The Final Call that presently there are 21 families still detained. “ICE is releasing detainees to family members who have legal U.S. status or transferring them to a facility in Pennsylvania,”she said. “Children should not have to endure confinement in a prison,” said Rosa Rosales, national president of the League of United Latin American Citizens (LULAC), the nation’s largest and oldest Hispanic civil rights organization in the country. “Now that this long-overdue decision to end the detention of families at Hutto, we commend the president for his humane actions. We hope this is an example of a more humane and fair approach to housing immigrants and in keeping with our American value system,” she said. The agreement between the ACLU and ICE says children are no longer required to wear orange prison outfits and must have more outdoor exposure. Additionally, expanded educational programming has been implemented and facility guards can no longer threaten the children with being separated from their parents as a disciplinary tactic. ICE is also required to eliminate the count system which forces families to stay in their cells 12 hours a day and allow regular legal presentations by immigrants’ rights groups. The Aug. 29 Houston rally was also attended by members of Free-The-Kids Colectiva, CRECEN, LULAC, and the Houston Peace Center. The rally was countered by angry White opponents, who yelled racial slurs. “Opposition is telling us we should leave this country but we are the original caretakers of this land,” said Mr. Chavana.